The site is part of the Philipps Universität Marburg on the Campus Firmanei. 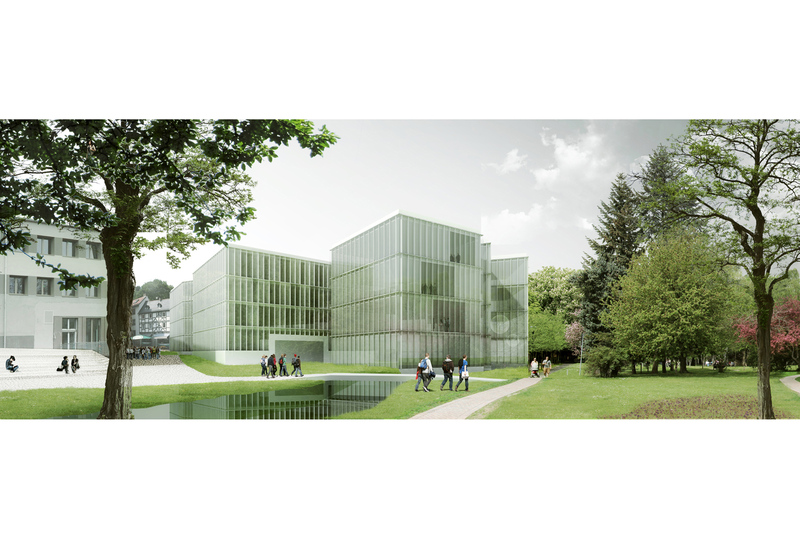 The plot is located in-between the city of Marburg and the Alter Botanische Garten, a 200-year-old garden of great historical and cultural value. The situation of the campus besides the botanical garden is not coincidental, science and the botanical garden have gone hand in hand for centuries with Carl van Linné en Charles Darwin as frontrunners. Our proposal continues this tradition by combining the botanical garden with the campus through an integration of architecture and landscape design, not only looking out on the garden but becoming part of it. We would like to create a campus as a healthy and inspirational environment for learning and culture. 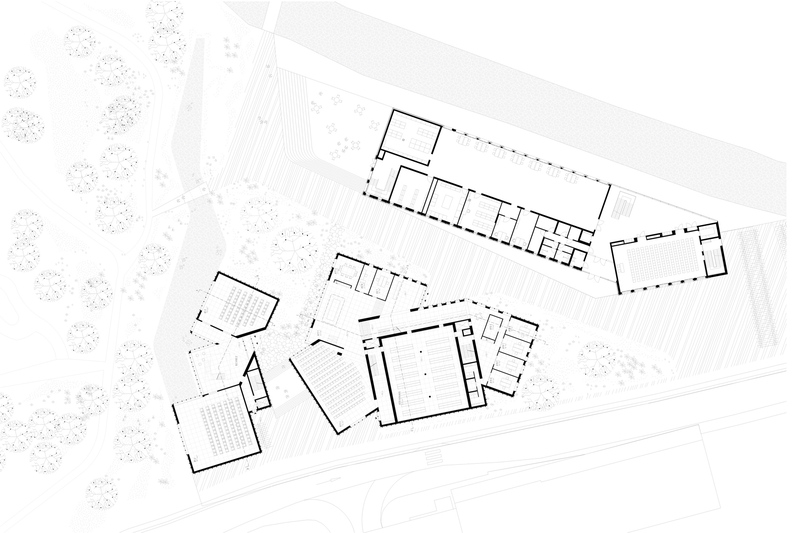 Urban concept – concept and routing through campus | The DDK– and seminar building are designed as a compact serie of linked volumes, efficient in use and allowing exterior spaces around the volumes as part of the campus. The buildings are placed on urban plinths, referring to the city through material and form while dealing with the transition between the diverse heights of the location. On top of this plinth the light architecture of the DDK– and seminar building emerge, referring to the pavilion architecture in and around the botanical garden. 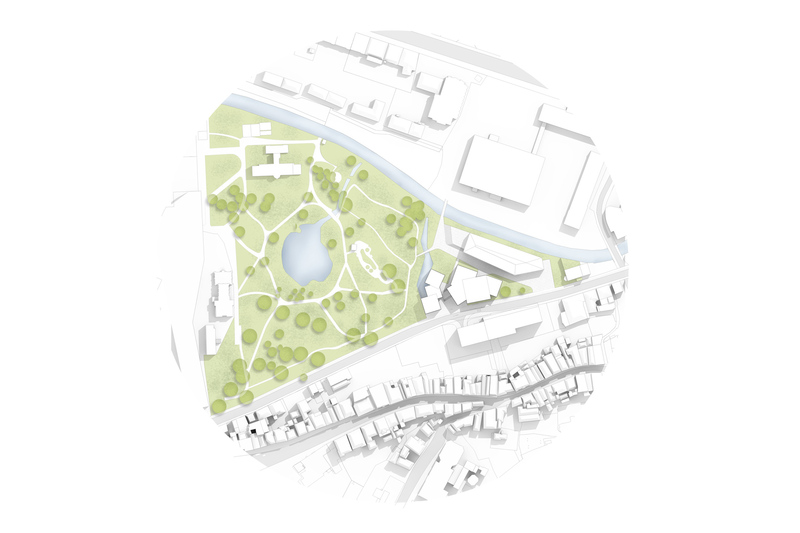 The choice for small compact linked volumes instead of large linear buildings is based on the principle of bringing the park into the southern part of the campus. Spatial planning concept | The current fence between the campus and the botanical garden is replaced by a body of water, acting as a soft barrier while following the language of the historical garden design. 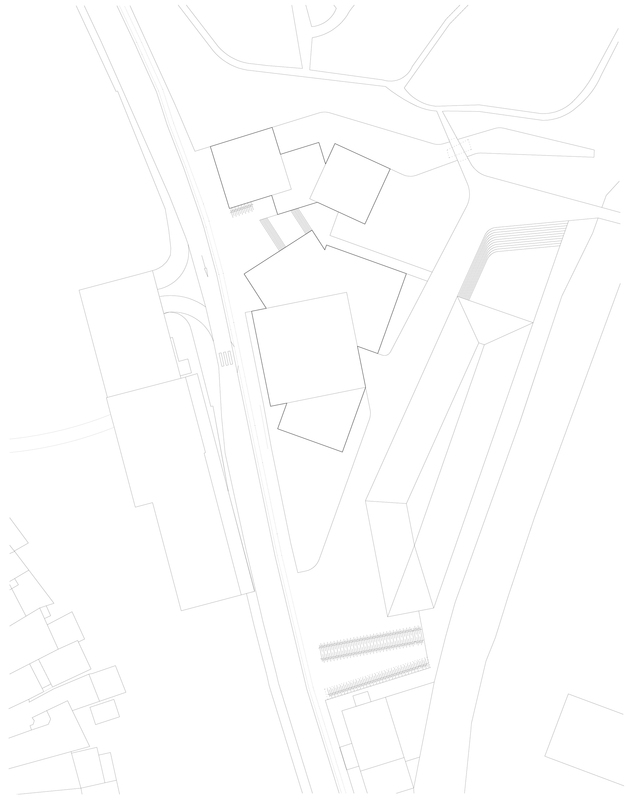 A gradual slope between the DSA and DDK building connects the Pilgrimstein with the pedestrian bridge, connecting the higher lying city with the new green garden campus. The route between the seminar building and the Pilgrimstein follows a meandering path, organically using the topography of the landscape and letting the park flow into the campus. 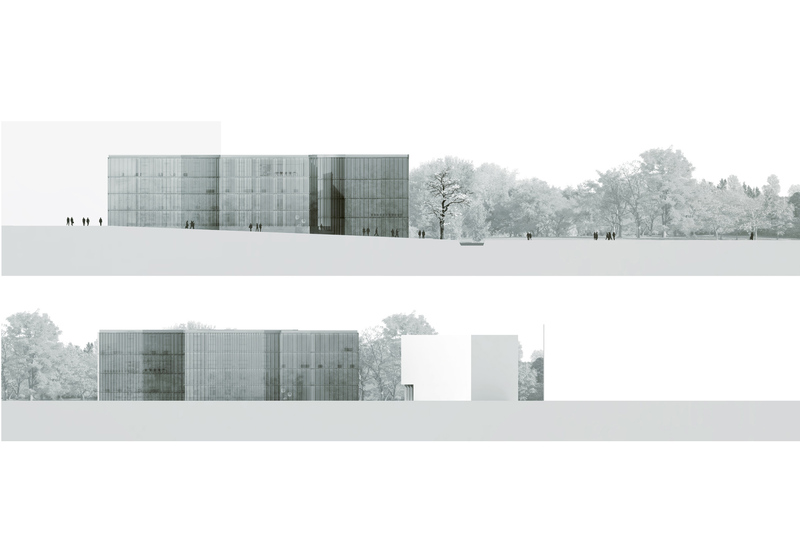 Technical concept seminar building | In our proposal for the campus the seminar building is the most embedded in the park as a pavilion like structure without the urban plinth. The façade refers to the DDK building in vertical articulation and materiality, detailed with aluminium and glass cladding and prefab construction. The façade flows in the same rhythm as the DKK building but with its own detailing, with less shadows and therefore reflecting the surrounding nature. 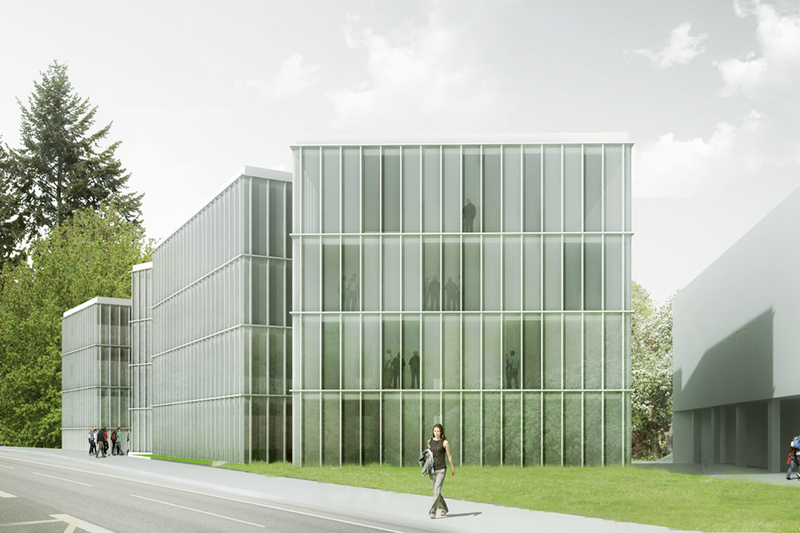 The use of glass as main material makes a strong link to the new library on the opposite side of the botanical gardens. The seminar rooms look out over the botanical garden with large panorama windows that can be darkened through solar protection.